Generally speaking, laser CNC Router at work, are only needed in the normal environment can be directly processed, do not have to create any special environment to process products. But this is only relative to ordinary products, special circumstances need to be special auxiliary gas to be processed. 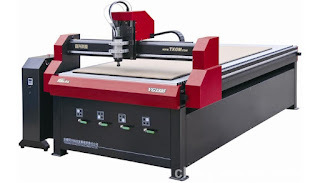 So laser CNC Router in cutting metal materials, why said to join the auxiliary gas? There are four reasons: one is to consider the auxiliary gas and metal material to produce chemical reaction, increase the intensity of work ability, better processing; second is through the gas equipment from the cutting zone blow slag, some cleaning slit; the third is cooling slits adjacent area and decrease occurred due to the factors of the size of the heat affected zone, can protect the focusing lens to prevent some of the combustion product contamination of optical lenses. Among them, the most important thing is the first point, generally based on this point to join the auxiliary gas. Since the need to assist gas, then the laser CNC Router which commonly used auxiliary gas it? Nitrogen: in cutting boards, such as stainless steel or aluminum, nitrogen is used as auxiliary gas, can play a role to the auxiliary cooling and protection materials. Because these materials are prone to oxidation, the use of nitrogen can greatly prevent this from happening. Oxygen: when cutting carbon steel, you can use the oxygen, because oxygen has a cooling and accelerated combustion to speed up the auxiliary role of cutting. General combustion is the need to have oxygen to be able to burn up, for containing a large amount of carbon impurities in carbon steel can accelerate the burning, so as to quickly cut. But it will appear to have largely blackening. Air: This is in order to save costs and the use of auxiliary gas, using air as the gas assisted can cut stainless steel, but on the opposite side minor glitches, polished with sandpaper can ensure maximum accuracy. That is to say, the laser CNC Router in cutting a lot of material, it is possible to choose the air as auxiliary gas. Therefore, laser CNC Router in the use process, usually directly choose air as gas assisted, unless it is finished processing requirements are very high, this time can be properly considered with nitrogen gas as auxiliary; or say hurry to processing of finished products and the choice to use oxygen gas as auxiliary gas.